Sudan Refugees Occupying CNTCI Office? 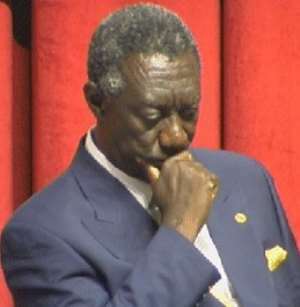 The minority leader in parliament, Mr. Alban Bagbin has stated that after personal investigations, President Kufuor has realized that the CNTCI loan his government was trying to contract was a scam but he had instructed his ministers to fight on to avoid disgrace. He said unknown to Ghanaians, President Kufuor took advantage of his recent one week leave and flew to London to conduct personal investigations into the background of the CNTCI, but after discovering the facts, he had still instructed his ministers to fight on. Addressing NDC supporters and later students of Takoradi Polytechnic last Saturday, Bagbin said even the recent address by Mr. Yaw Osafo Maafo, Minister of Finance at his recent press conference to react to the NDC stand on the CNTCI, was a fake. He quoted Mr. Osafo Maafo as having provided the said address as Suit 3/A 24, Marlow house London. W2 6HJ UK but according to the minority leader he had just returned from London where he spent time to look for that location but after an exhaustive search he was told that the address did not exist in London. Bagbin further told the students that the only address that came near what Osafo Maafo provided was Flat 24 Marlow house. According to him when he went to the house to ask whether that was the office of the CNTCI, he was surprisingly told that refugees from Sudan were occupying the house. Brandishing large papers, which he said, contained evidence to prove his claim the minority leader said he was prepared to sponsor doubting journalists and government officials to London to investigate the new address and that if he was proved wrong, nobody should take serious any comments he would make against the government in future. He said the minority were not out to thwart the efforts of the government in contracting loans to develop the country otherwise they would not have supported the majority side to approve several loans that were brought before parliament. He apologized for the initial support given to the CNTCI loan by the minority, adding that they lowered their guard and the majority slipped through. The minority leader further said when it came to competence, the NPP could not match the NDC but the NPP had been using lies to throw dust into the eyes of the people. He alleged that the Kufuor government did not nominate Dr. Mohammed Ibn Chambas for appointment as Executive Secretary of Ecowas,adding that the government nominated about five people for consideration for the post but they were all rejected. According to Bagbin, the Ecowas secretariat later told President Kufuor in Nigeria that they wanted Dr. Chambas. He quoted President Kufuor as having told the secretariat that Chambas was not a member of his party but he would inform him when he returned home. The minority leader said when the President returned home, he called Alhaji Aliu Mahama, the vice president, to ask Chambas if he was interested in the post and the former NDC MP accepted it. Chambas' appointment therefore had nothing to do with the so-called all-inclusive government, he added. Bagbin also challenged President Kufuor to cause forensic audit into the 19-year rule of the (P)NDC, government and the three-year reign of the NPP administration for the world to see which of the governments would come out as the most corrupt. Bagbin further challenged President Kufuor to cause the publication of NDC handing over notes for Ghanaians to see whether the party left the state coffers empty when it was leaving office. “Where did they get the millions to renovate their bungalows on assumption of office if the treasury was left empty?” he asked. According to him when it came to corruption the NPP was worse, citing the fictitious dealings of Alhaji Moctar Bamba as a typical example. He said President Kufuor was aware of this but he had the courage to throw a challenge to the Ghanaian media to provide evidence of corruption against his ministers. The former Ashanti regional minister, Mr. Daniel Ohene Agyekum, said had the NPP government succeeded in sourcing the fictitious IFC loan, they would have lined their party coffers with a whopping ¢9 trillion. Agyekum also said as a native of Ashanti he was aware that government functionaries had been putting up in Kumasi adding that at the appropriate time, the stick that they had used against NDC would be the same to be used against them. He said kerosene and petrol which used to be sold at ¢5,000 during the NDC regime had now shot up to ¢20,000, thus bringing untold hardship to Ghanaians but some people were still supporting the government because of the way they were being deceived. Present at the two functions were the flagbearer of the party, Prof. Evans John Atta Mills, who was on a campaign tour of the Western Region.